The Jim Crane State Farm 2010 Highland Open “Ace for the Cure” tennis tournament was held April 16-18 at Highland Park in Baton Rouge. The $21,500 raised for the Cystic Fibrosis Foundation was a record for HPTA’s annual tournament proceeds. We deeply appreciate the 120 doubles teams who played in the tournament and our 84 Rose Sponsors who supported CFF by purchasing symbolic roses for $100 each. 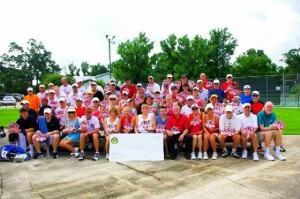 Also, we could not have realized such a successful tournament without our title sponsor, Jim Crane State Farm; presenting sponsor, Louisiana Governor’s Games; gold sponsors, Albermarle Foundation, and Amedisys; and silver sponsor, On Court Tennis. We also received tremendous help, both monetary and in-kind, from generous donors. Click here to see pictures from the 2010 tournament and the “65 Roses” campaign. The Highland Open Tennis Tournament (HOTT) team members were outstanding. We appreciate their hard work and dedication: Lisa Sanner, tournament director, Fred Aldrich, Angel Ellis, Rusty Jabour, Debbie Klotzbach, Heather Jayson, Joycelyn Leblanc, Michael Doyle, Mike Grimes, Sandra Harshbarger, Wendy Parrish, David Oliver, Bo Boehringer and Erin Achberger.